Andrew Nose What He's Doing! 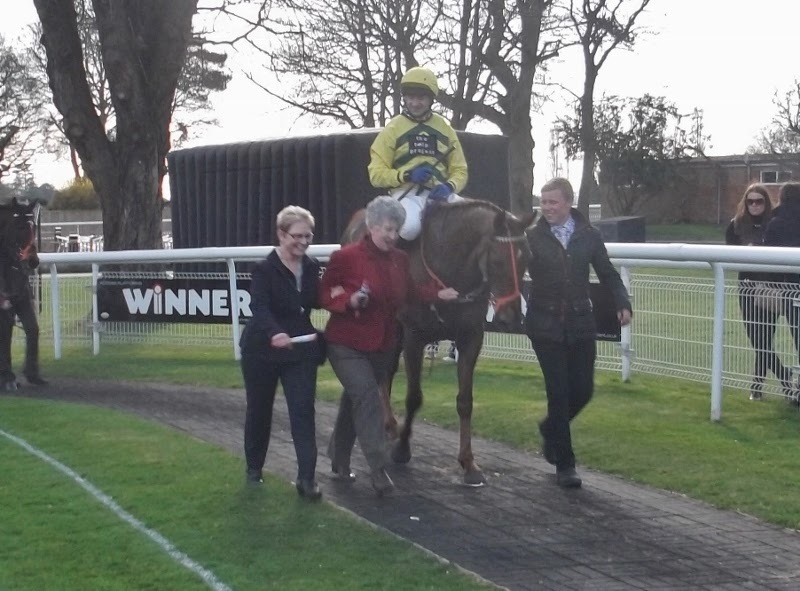 Andrew Thornton took the ride on Itoldyou this time at Fontwell (15/3/2014) in a 3 and a quarter mile handicap chase. Although there were only four runners the betting was tight and Itoldyou and West Cork Flash vied for favouritism at about 6/4. West Court Flash had been runner up to Itoldyou last time out , but this time Itoldyou was 6 pounds worse off at the weights and the race was half a mile further on better ground. Andrew settled Itoldyou at the rear of the field and let him enjoy lobbing round in this position. He jumped well and going out on the final circuit he took second place three lengths behind West Cork Flash who had set the pace. Itoldyou jumped 4 out so well that Andrew found himself almost upsides the leader a little too early. He eased back and at the same time Jamie Moore, on West Cork Flash, kicked on and a gap appeared again. Andrew needed to ask Itoldyou to quicken to take closer order. At the last fence West Cork Flash had only a tiny lead and Itoldyou soon went in front. However West Cork Flash renewed his effort in a classic battle for the line and they crossed the line locked together and a photograph was called for. There was an anxious wait until the result was announced, with the photo showing that Itoldyou had held on by a nose. Kingscombe completed a hat trick today (12/3/2014) at Southwell when winning a 1 mile 6 furlong handicap, on his beloved fibresand surface. Up against the horse he had beaten last time, but six pounds worse off for the neck he had won by, the betting suggested that the outcome would be reversed. Rab Havlin jumped him out to take a position just behind, and to the outside of, one of the outsiders who led. The pace was nothing more than steady and the four runners were still in a bunch turning for home. Here Rab asked Kingscombe to go on and take the lead, which he did pursued by his rival from the previous time. Despite the turn round in the weights Kingscombe would not give up the lead and went on to win more easily this time by 1 and a quarter lengths. It was a beautiful sunny morning at the yard today and some of the horses were schooled over hurdles on the all weather gallop. Linda continued her excellent run when Kingscombe returned to Southwell this afternoon, the scene of his recent win. This time he was facing an extra two furlongs, and under Seb Sanders he broke well and was soon in the lead, out of the kick-back, setting a sensible pace. He still led turning into the home straight and soon shook off all but one challenger. He was headed by this horse a furlong out but, as he did last time he ran there, he rallied to get back up by the line, winning by a neck with a further five lengths back to third.